More than a year after its launch, Windows Phone 8 will finally get its first major update in the form of Windows Phone 8.1. Now that the update's release is imminent, developers have started getting their hands on the new version's software development kit, and they're reporting on the improvements Microsoft has made. The biggest news is that one important Windows Phone 8.1 change points to the possibility that the smartphone operating system may finally be merged with the tablet OS Windows RT. In addition, with Windows 8.1 Microsoft will begin using the same .appx package for apps that Windows 8 apps already use. Although it's not a full unification yet, this could be the first step toward merging the operating systems for good. If Windows Phone and Windows RT are using the same apps, there's little reason to keep them separate, after all. And if iOS and Android can be more or less the same between smartphones and tablets, then so too should Windows be able to. 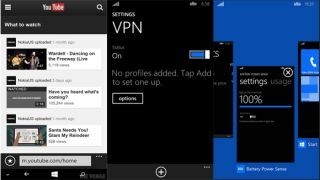 The unification of Windows Phone and Windows RT may be the most exciting part of these Windows Phone 8.1 leaks, but there are plenty of other features being revealed by developers too. For example, Windows Phone 8.1 appears to let users choose different default messaging apps for the first time. There's also a "Battery Power Sense" feature to monitor battery life, VPN support, a "Storage Sense" feature for installing apps to SD cards, newly separate video and music apps, a new podcast app, and the rebranding of SkyDrive to OneDrive. Multitasking is different in Windows Phone 8.1 too, according to this developer. Pressing the back button now sends apps into the background instead of closing them, while swiping downward closes them, much like Windows RT. The camera app has a new layout as well. Finally the browser has been updated to Internet Explorer 11, Facebook account and photo integration appears to be gone (though Twitter is still present and iCloud has been added), and there's support for on-screen buttons, possibly to accommodate future phones without physical buttons. Notably, two important Windows Phone 8.1 features are missing from this SDK: the new "action center" notification center and the "Cortana" virtual personal assistant and Siri rival. But those are expected to appear before Microsoft sends the final version of Windows Phone 8.1 to developers around April. Before there was Windows Phone 8.1, there was Windows 8.1!